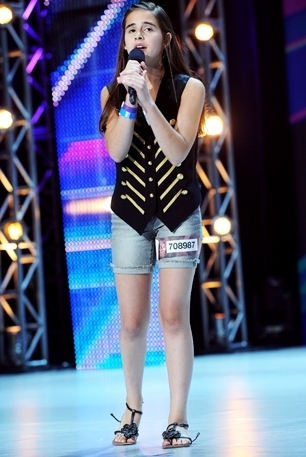 Carly Rose Sonenclar, 13, ensorcelled the “X-Factor” judges last night with her performance of “Feeling Good,” a song made famous by jazz great Nina Simone in 1965. Things looked like they were heading in the wrong direction before Carly Rose began to sing–the youngster from Westchester, N.Y., confessed to nerves, fumbled with her water bottle and drew skeptical looks from the judges when she said she was going to try to tackle the Simone classic. “Can I ask you something–did you rehearse?” L.A. Reid asked. The sour mood changed when Carly Rose got into the song; turned out she had one of those older-than-her-years Jackie Evancho-type voices (but with soul), one of those “Wizard of Oz” voices where you think there has to be a person behind the curtain. It should be noted that Carly Rose is something of a pro. Just look at her website loaded with videos, glamor shots, tweets. The bio on her site declares “Now 13 years old, Carly feels as comfortable in the world of musical theater, having performed in numerous Broadway and off-Broadway shows, as she does performing solo in front of thousands of people. ” So was the nervous backstage thing part of the act? Increasingly it seems these reality singing shows are turning to folks who have been around the block a bit, even if they are only teens. Viewers get the feeling that they’re making a new discovery, while producers get some insurance that their contestants will deliver a professional performance. Still, she did sound good, no matter her resume. So how did the young singer compare to the original diva? Listen to both versions.